^ Morphy, Erika. This is Tim Cook's Apple: A Company Where 'Mini-Steve' Gets the Axe. Forbes. [2018-06-28] （英语）. ^ Scott Forstall, the Sorcerer's Apprentice at Apple. Bloomberg.com. [2018-06-28] （英语）. ^ Junior Convocation Featuring iPhone's Scott Forstall. The Unofficial Stanford Blog. [2008-03-07]. ^ Scott Forstall: Executive Profile. Businessweek. [2009-05-13]. ^ Father Of Mac OS X Is Leaving Apple, Gizmodo, 2011-03-23. ^ Adios Avie, SF Gate Tech Chronicles, 2006-03-27. 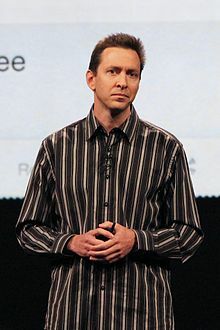 ^ Apple - Press Info - Biography of Scott Forstall. Apple Inc. [2008-06-20]. ^ Milian, Mark. Apple's Siri voice assistant based on extensive research. CNN. 2011-10-04 [2011-12-01]. （原始内容存档于2011-11-28）. ^ Apple Announces Changes to Increase Collaboration Across Hardware, Software & Services. [2012-10-29]. ^ The Amazing iOS 6 Maps. theamazingios6maps.tumblr.com. [2018-06-28] （英语）. ^ Fiegerman, Seth. Apple Pays Swiss Federal Railways $21 Million For Clock Icon [VIDEO]. Mashable. [2018-06-28] （英语）. ^ Arthur, Charles. Apple's Tim Cook shows ruthless streak in firing maps and retail executives. the Guardian. 2012-10-30 [2018-06-28] （英语）. ^ Fired Apple Executive Scott Forstall 'Was The Best Approximation Of Steve Jobs That Apple Had Left'. Business Insider. [2018-06-28]. ^ Lessin, Jessica E. Apple Shake-Up Signals Tim Cook Era. Wall Street Journal. 2012-10-31 [2018-06-28]. ISSN 0099-9660 （美国英语）. ^ Kelion, Leo. Tony Fadell: Father of the iPod. BBC News. 2012-11-29 [2018-06-28] （英国英语）. ^ Business Insider. Wikipedia. 2018-06-21 （英语）. ^ A tale of two execs: Microsoft's Sinofsky and Apple's Forstall. CNET. 2012-11-03 [2018-06-28] （英语）. ^ Inside Apple's major shakeup. Fortune. [2018-06-28] （英语）. ^ Wong, Raymond. Apple iOS boss Scott Forstall reportedly refused to attend Jonathan Ive’s meetings. BGR. 2012-11-03 [2018-06-28] （美国英语）. ^ Scott Forstall Reportedly Forced Out of Apple. [2018-06-28] （英语）. ^ 500. The Telegraph. [2018-06-28] （英国英语）. ^ After Getting Pushed Out Of Apple, Here's What Former iOS Leader Scott Forstall Has Been Up To. Business Insider. [2018-06-28]. ^ Scott Forstall on Twitter. Twitter. [2018-06-28] （英语）. ^ Heisler, Yoni. Ex-iOS boss Scott Forstall resurfaces in a place you wouldn’t expect. BGR. 2015-04-17 [2018-06-28] （美国英语）. ^ Creating Magic: A Conversation with Original iPhone Engineers & Software Team Lead Scott Forstall | Computer History Museum. www.computerhistory.org. [2018-06-28] （美国英语）.